This installment of our architecture series will introduce the templating system used by CiviCRM as the presentation layer (e.g. to actually render forms and pages). Every CiviCRM screen is "composed" from one or more template files. These files contain a combination of HTML tags, text, variables and (often) some code to control presentation logic. CiviCRM uses an open-source templating engine called Smarty. If you are planning on examining, debugging and/or and modifying CiviCRM screens - you'll want to spend some time reviewing Smarty's online documentation. function preProcess( ): This function is called before a form is built. All objects needed to build the form should be built in this function. CRM: Most of the CiviCRM specific source code is stored in the directory. This directory is further sub-divided into other directories based on functionality (Core, Utils, Contact, Contribute, Mailing etc). xml: CiviCRM schema and the base Data access objects (DAO) are automatically generated from a simplified xml scheme which contains a fair amount of sql and type information. This makes it relatively easy for us to change the sql code, figure out what changes were made in a version and add meta information to a table within PHP. Functional and contact-level access control is now implemented on the sandbox. User access overview describes the permissioning options. Logins and User Roles Some 'example roles' have been setup on this sandbox. 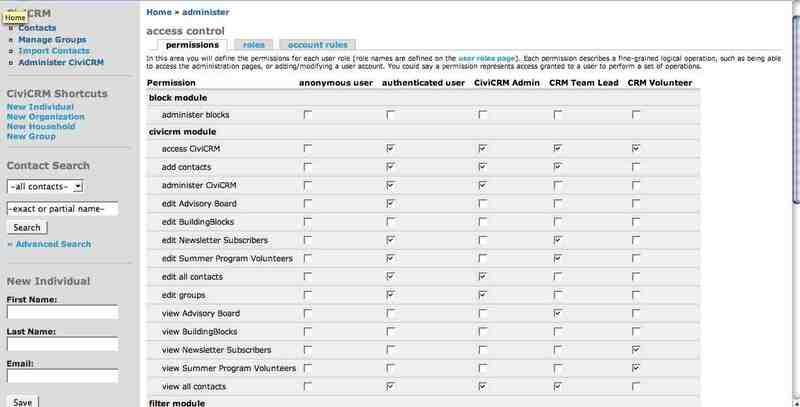 You can use the logins below to try them out: Role: CiviCRM Admin Login: crmadmin demo Role: Team Lead Login: teamlead demo Role: Volunteer login: volunteer demo Current Sandbox Access Control This is a snapshot of the current access control setup for the sandbox. Notice that for each 'Group' there is an 'edit' and a 'view' permission (edit encompasses view). There is also an 'edit' and 'view' permission for the Saved Search - 'Major Donors-California'. CiviCRM has a lot of details under the covers that people might miss. One such feature is a simple Google Maps integration. From the contact list, select one or more contacts. 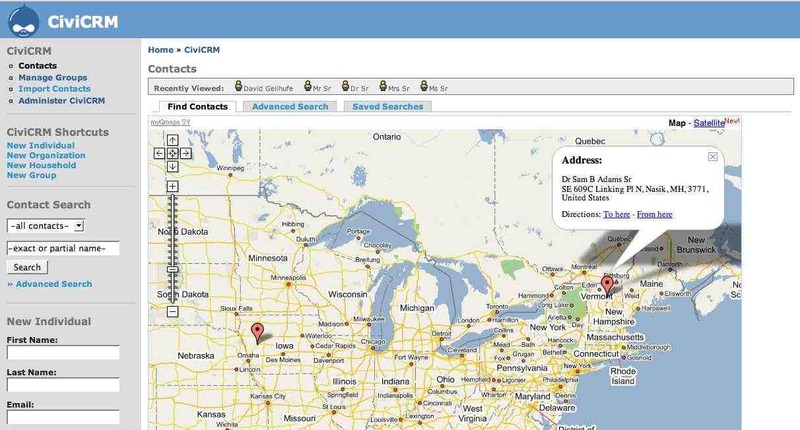 From the drop down actions menu, select "Map Contacts using Google Maps" and click the go button.